Recently I again tweaked our preorder method with the long-awaited expansion for Euphoria, Ignorance Is Bliss. Today I’ll share the steps I went through to run this preorder, including commentary on changes I made after learning from Wingspan. October 19, 2018: I officially signed the quote from Panda, our manufacturer, indicating the first-run quantity of the expansion. Panda immediately started producing the non-printed components for the game and soon after billed me for the first 50% of the manufacturing cost. January 20, 2019: Production ended and Panda coordinated with OTX, our freight shipping company, to ship the expansion via ocean freight. Most copies of the expansion went to our warehouse in the US; some of them also went directly to fulfillment centers based on my estimates. February 7, 2019: I sent our monthly e-newsletter on this day with the soft announcement of the expansion. This when I shared the official name of the expansion and the box art, and I spent the next 2 weeks revealing information, photos, and design insights about the expansion in the Euphoria Facebook group and on our website, culminating in the reveal of the full rulebook. February 20, 2019: For the various advance reviewers of the expansion, they still had to wait until February 27 to share their opinions of the expansion, but because I had already fully revealed the contents of the expansion at this point, they were allowed to openly talk about the expansion in an objective manner on this date (components, photos, rules, playthroughs, etc–just not their actual review). The reason we have an embargo for the review itself is that I want the most attention drawn to the product at the exact time that people can actually preorder it, not before. February 27, 2019: Preorder launch. Note that this was only a few weeks after the soft announcement, as I felt the gap for Wingspan was a little too big. I want to build anticipation, not impatience. Our fulfillment center in the US started sending Champion orders right away. March 3, 2019: Preorder end. This amounted to a 4-day preorder instead of the 7 days I had for Wingspan. This was primarily out of respect for retailers, as we completely stopped accepting preorders after that 4-day period. It was at this point that our distribution broker told distributors how many copies were available, and distributors solicited retailers to see how many copies they wanted. March 26, 2019: This is when the last few preorders were shipped. Most were sent earlier, as we had freight shipped some copies of the expansion directly to fulfillment centers, but there were a number of customers who also ordered other products, which we needed to ship from the US. It was also at this point that our broker had solicitation quantities from distributors, and we still had extra copies of the expansion, so I put them back on the webstore at full MSRP. Our broker also shipped the expansion to distributors this week. May 3, 2019: Worldwide retail release date. This is 2 months after the preorder, which is a little longer than I’d like it to be. It’s just that distributors and retailers like to have time for solicitations, and if we have an official release date, we want to make sure distributors have plenty of time to receive the games, process them, and ship them to retailers. Accompanying Accessory: One of the nice things about a direct preorder is I can offer special products that don’t have a place in distribution. In this case, I decided to offer a Euphoria board specifically for use with the expansion. 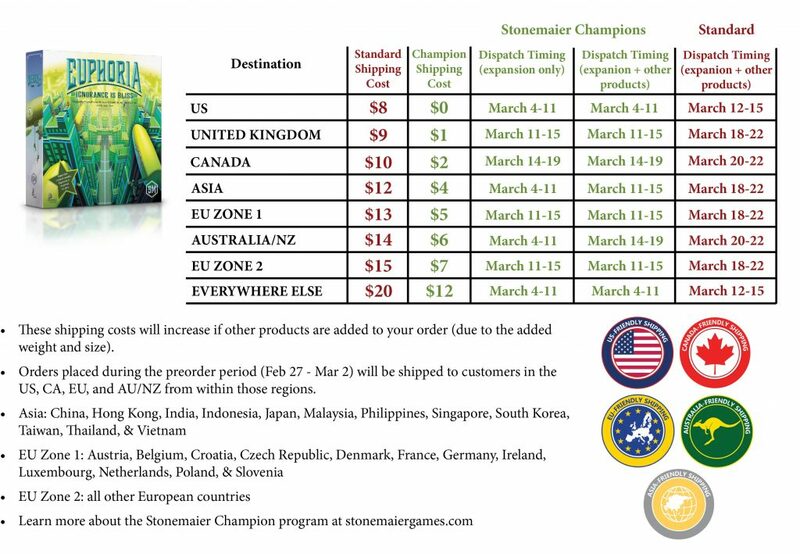 Champion Confirmation Email: While anyone can place orders and preorders from our webstore, if you sign up as a Stonemaier Champion, you gain a few perks, one of which activates with a promo code that only works if you’re registered as a Champion. Previously, new Champions didn’t get a confirmation email with that promo code when they signed up, leading to lots of confusion. Fortunately, Bold added a confirmation email option to their app in time for this preorder, and it worked wonderfully. Discounts: For past preorders, I haven’t offered discounts for related products. However, because we were using the expansion as both a way to serve existing Euphoria fans and invite newcomers into the world of Euphoria, I thought a discount on Euphoria itself was appropriate. We didn’t offer a single bundled option (customers had to add each item separately to their cart), but I’ve since added bundles to our webstore using a Shopify app. Asia and Australia/NZ: For Wingspan, I used fulfillment centers in the US (Greater Than Games), Europe (Spiral Galaxy), and Canada (Starlit Citadel), but I decided to add Asia (VFI) and Australia/NZ (Aetherworks) to better serve customers in those areas. Accompanying this was a rather elaborate shipping chart (see below). The results were around 35 orders for Asia and 60 orders for Australia/NZ. Aetherworks did a fantastic job, and VFI was fine. I’d love to hear your thoughts about these adjustments to our preorder methods. If you’d like to read about other campaigns I’ve run, here’s a full page of them. The transparency and continuous improvement here is greatly appreciated Jamey! You mentioned wanting to build anticipation rather than impatience, with regard to the preorder announcement vs release date gap. I wonder if this dynamic changes for patrons when they support companies directly versus how they support them on Kickstarter??? In terms of perceptions or expectations you know? For instance, it would be interesting to know how patrons perceive shipping / manufacturing delays on KS as opposed to when ordering from the brand site directly. Thanks Eric! My guess (for your shipping example) is that Kickstarter backers are so accustomed to projects delivering after the original estimate that they are more forgiving than when they pay for a product that’s already in stock but don’t receive it for longer than they expected. We had that happen with Wingspan–there were quite a few people who were very upset when they received their game 5-7 days after my original projection (partially due to our fulfillment center messing up for a few days, and partially due to the sheer volume of orders). Great article! You mention bundles on the online store. Where does one find those? Don: If you click on any of our games on the homepage, it will show you how to buy the game by itself and also a separate widget showing you the bundle in which the game is included. Very interesting! Do you think a comparison article in the future between the two experiences of release will be comparing apples and oranges due to the absurd Wingspan demand? An expansion for a game seems like it would naturally come with a more reliable gauge of demand, versus a brand new product. Also, did you do your “standard” print run of 10k units, and were you happy with the amount you chose to print? Also, did you prep early for additional print runs (to get in front of potential over-demand), or did you see it as I wrote above — apples and oranges with a more certain demand variance? Yeah, it’s a tough comparison, but I still think it’s worth applying what I learned the last time around to each subsequent attempt. For expansions, we typically print less, as only 20-30% of people who buy/own the core game will buy the expansion. 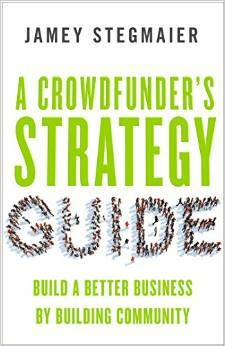 In this case, we did not prep in advance for a speedy 2nd print run. It’s great you are continuing to think of us in the Antipodes. Was impressed to see you had added Aetherworks back into the pre-order chain, they’ve always provided sterling service from everyone I speak to. Thanks for sharing this, Jamey. As a Champions (because of Wingspan), I appreciated the chance to be part of this early on. In addition, having the board as an extra option was perfect. I ended up buying all three, expansion, board, and base game, all because of the above process kept me informed and made it so easy. So impressed and delighted by your continued honesty, candor, and drive to improve the operations of Stonemaier Games. These all seem like excellent improvements to your process, thanks for being so committed to quality in every aspect of the business. It’s one of the many reasons I’m so proud to evangelize the Stonemaier brand. Great to hear your experience with Aetherworks was a great one. My fear though is the order numbers were low for Australia/NZ and may not be worth the effort for future releases. Is this possibly the case or am I being over concerned? Even if we only sell a carton of games to Australia/NZ, it’s still worth getting them to Aetherworks and shipping from there. The tough part is accurately estimating demand in advance so I send the right number of games from China, but I can always send more from the US if necessary.